"This book was very good had a hint of Halo to it with interesting concepts about the AI. Would like to read a second instalment." "Solid book. Well written. I enjoyed it. Liked the Wing Commander take down of the heavy cruiser." Your story goes well beyond all that of course. I really liked the idea of the lure-ship. I'm just letting you know I am going to borrow your idea if I ever run another science fiction session. Good book, nice story. Believable characters." "The book was a fun read. I like that the main character is a female. You don't see that in a lot of science fiction books. This was definitely a well-written space adventure with plenty of action and a lot of creepy mystery. I loved the friendship between Opal and her AI companion Clarissa. It's a very satisfying story and I enjoyed it very much!" 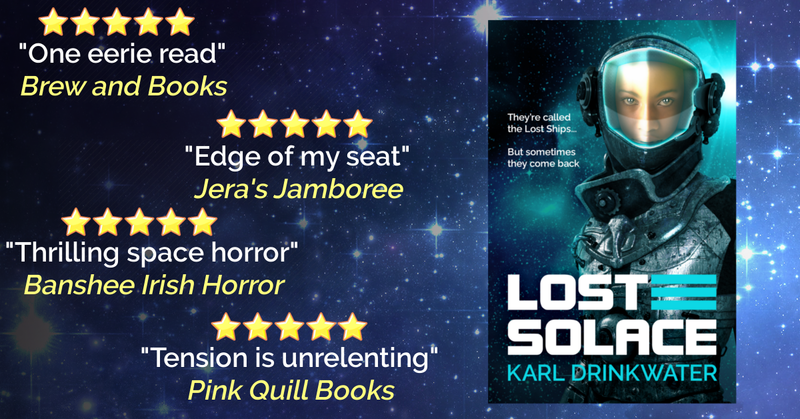 "Lost Solace has been described as a "Haunted house story set in space", which I've found to be an accurate description. The premise is that our protagonist, "Opal", has absconded with a secret, advanced military spacecraft with an experimental A.I. on board, named "Clarissa". She is searching for what is known in the fictional universe, as a "Lost Ship", as she believes her sister went missing on one. Without giving anything away, a Lost Ship is basically a Mary Celeste type of deal, a mysterious ghost ship. The book shares some similarities with the film "Event Horizon", which is all I'll give away. What follows is a great story, equal parts creepy, funny, riveting, and action-packed. One of the real highlights here is the relationship between Opal and Clarissa, as Clarissa is such an advanced A.I., she makes a fantastic partner to Opal, and their banter, joking around, and genuine affection for each other is really quite touching. As well as that, I find that male authors usually really struggle to write female characters. That is not the case here at all. It's a very genuine sounding story, with genuine characters, despite all the eldritch horrors contained within it." I always appreciate the lengths fans go to in order to spread the word about their love for my books - it really does mean a lot, and help my career. 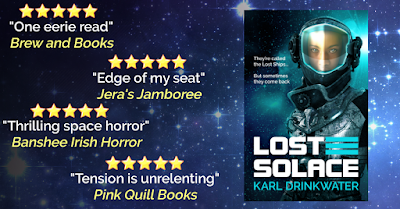 If, of some mad reason, you want to see what else people have said about Lost Solace, check out the review quotes on the book's page.